"Restless" Is a 2003 65' Pacific Mariner she is hull # 35 of 65 and was designed by two very talented west coast naval architects. Her hull was designed by a master – William Garden. Garden has been building and designing boats since about 1935 and few people alive know more about boat design and efficiency The exterior and interior were designed by Greg Marshall, who has many mega yachts to his credit. The Pacific Mariner 65 was conceived by boat builders who want to give the American public an affordable, reliable, low-operating cost boat that would be versatile enough to operate at displacement speeds for long distance cruising or at 20 knots for long weekend cruising. She would be big enough for six, and still have a cabin for crew. You owe it to yourself to view the "Restless" and see what she has to offer. 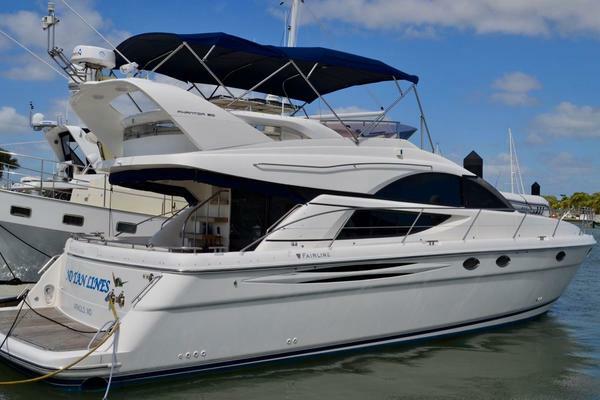 United Yacht Sales New Jersey would love to guide you through a personal showing of this 65' Pacific Mariner Motor Yacht 2003. 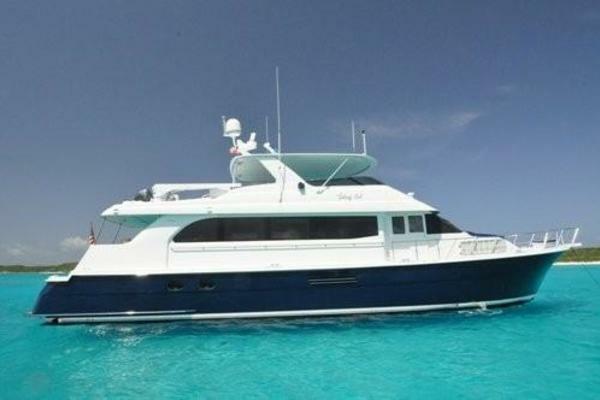 This yacht for sale is located in Seattle, Washington and priced at $879,000. For a showing please contact us by filling out the form on this page and we will get back to you shortly! "Restless" Walkthrough Upon boarding the vessel from the large swim step onto the aft deck, which can be completely open or enclosed with a full Strataglass enclosure, you enter the salon from stainless steel framed sliding glass doors. The salon of "Restless" is both comfortable and elegant with beautiful satin finished cherry interior woodwork with custom burl wood inlay counter tops and soft fabrics throughout. To port is an L-shaped sofa with storage below, and is complimented with a custom high gloss electric base coffee/dining table. To starboard are two occasional chairs and a free standing table, and forward is the built-in entertainment center with wet bar and wine cooler in custom cabinetry.Going up 4 steps to the pilothouse level is the extremely spacious galley to port and a staircase leading up to the flybridge. To starboard is the custom buffet cabinetry for dish and serving ware storage. There is new wood flooring throughout the galley and pilothouse area.Forward of the galley is the comfortable forward facing L-shaped dining settee along with complete pilothouse lower helm station. There are port and starboard sliding doors for quick access to the walk-around side decks, and 2 full-size Stidd helm chairs that can be swung around to access the settee table for dining.Forward to starboard is a wide semi-spiral staircase with a custom wooden handrail leading to the owner and guest accommodations. At the base of the steps is the combination day head/guest head. Moving forward is the VIP stateroom featuring a centerline queen bed with a large ensuite bath to starboard.Moving back aft to port is the guest stateroom with twin berths that have been custom designed to convert to a full king berth when preferred, and private entrance to head.All the way aft is the master stateroom with centerline king bed, ensuite bath with tub and heated towel bar, 2 large hanging lockers, a custom wall of drawers to port, and Makeup desk/storage area to starboard and the television is recessed into the fwd bulkhead. Aft Deck The 65’ Pacific Mariner has the most versatile and usable aft deck of any yacht in her size range. along the aft is an upholstered settee with a free standing table and custom folding chairs that can be stowed away behind the interior salon settee there are two warping winches to the port and starboard operated by a deck mounted foot switch for easy line handling, then moving aft through the port stainless steel gate you can easily take two steps down onto the large fiberglass swim platform with a custom built swim ladder. The full Strataglass enclosure offers complete weather protection or can easily be removed for a complete covered open-air aft deck. From the starboard end of the aft deck settee, you enter down a staircase to the crew’s quarters with a sink, head, air-conditioning and laundry center and going forward through a water tight door is the engine room access. Salon The salon is beautiful with its rich satin finished Cherry woodwork and elegant furnishings. The salon table rises electronically from coffee table height, to formal dining table height and transforms the casual setting to a formal dining area in a matter of minutes. Galley The gourmet galley is complete with full sized appliances, granite countertops, and an abundance of drawers, cabinets, and counter space. Brown and black flaked custom granite countertops. Kitchen Aid stainless steel side by side refrigerator/freezer with icemaker & water dispenser 22 cu.ft. GE Profile stainless steel microwave with light and fan. Flybridge The flybridge on "Restless" is easily accessed from the interior staircase between the salon & galley or from the aft deck ladder with a covered hatch. The spacious bridge features a large settee with dining table, retractable sunbrella biking top and a canvas covered helm station. there are two rotating helm chairs and a carpeted deck. 14' Rendova hard bottom inflatable tender with newer /50 hp Yamaha 4 stroke engine included is a new tube for the tender.